WWithout a halt, the Russians passed by, perhaps in order to escape the question if this wasn’t just the area they had combed all the previous evening, but more likely they were taking advantage of our stop and used the time to check the surrounding for eventual additional fragments. We took our time documenting the new find which was obviously an ordinary chondrite, and continued after some thirty minutes and a cup of tea. As circling the area in wider spirals had not lead to the find of a second fragment we joined the others and continued in parallel bearing towards the direction of the crab. After one hour of straight driving the landscape slowly changed. The undulating terrain now became more complex. Knolls and hills were obstructing considerable surfaces from our views. Furrows, steep gullies, yardangs, larger boulder fields and small depressions provided plenty of blind spots and shadows. 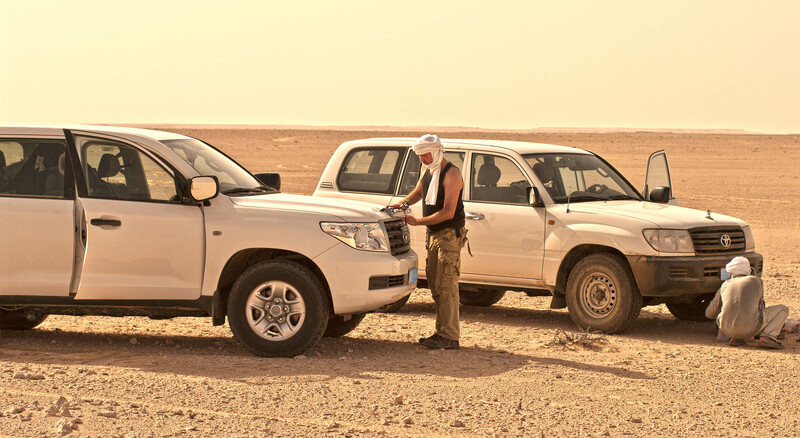 The continuous evading, circling and turning was strenuous, both for the driver and navigator, who also had to constantly keep in sight the second vehicle, our mutual life insurance in this hostile wasteland. We made slow progress. To provide us best sight, Thomas and I were usually driving with windows down. Either because in case of stops and turns the command “batten down the hatches” was usually given an instant too late, or because the window lift reacted just a second too slow, there was as much dust inside the car as in our wake. Cloaked with long sleeves, our tagelmusts and dust goggles, the vehicle’s air condition powered up to the max, we battled with boulder fields, steep banks and the inevitable pseudo meteorites. At noon the outside temperature had already risen to 108°F and despite the air con the cockpit felt like an out of control oven. Anxiously I monitored oil and coolant temperature because the last thing we needed was an overheated engine. Suddenly a small meteorite emerged, merely two meters from my co driver’s side. “Stop”, I called out and Thomas hit the brakes. It was a small angular chondrite fragment which already had developed a shiny patina of desert varnish. When I looked around for a landmark I was surprised to see we had already reached the “crab”. Some hundred meters away it rose above the shallow hills like a petrified predator. I hadn’t recognized it at first sight because we were approaching it from an opposite angle. 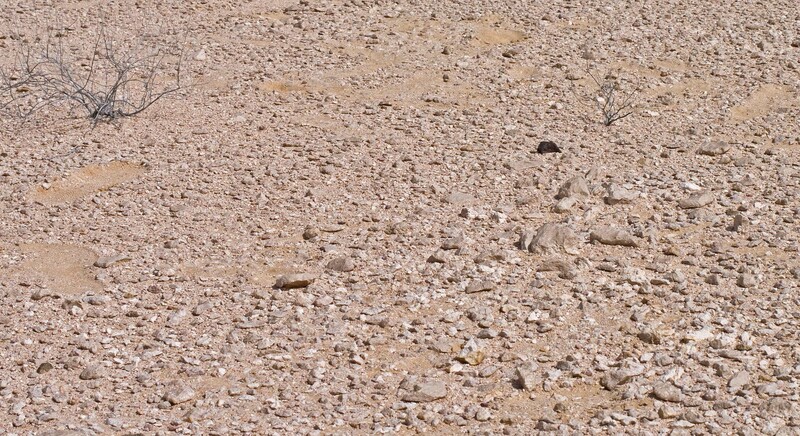 It was frightening how completely different one and the same patch of desert could occur in changing perspectives. As we documented the find, Pjotr and Ivan showed up and suggested to continue on our course, despite the new find. I disagreed as I wanted to investigate each new find location as thorough as reasonable and thus voted to rather search the area for another hour. After a brief discussion this was accepted only reluctantly by the others. When we met at the appointed coordinates an hour later Thomas and I hadn’t collected anything else but more dust. As Pjotr drove up the hill we had parked the car, I greeted him with the remark that he was probably right to leave the place and that we had wasted an hour of daylight by searching here. “Not quite” he smiled. “I think it was a pretty good idea to check the place” he added while Ivan opened the trunk and pulled out a heavy specimen bag with both hands. Grinning like a cheshire cat he handed me a large and breathtakingly beautiful chunk of meteorite. “We found it some 500 meters from here. It lay on top of a small hill and it was literally visible for miles” he explained. 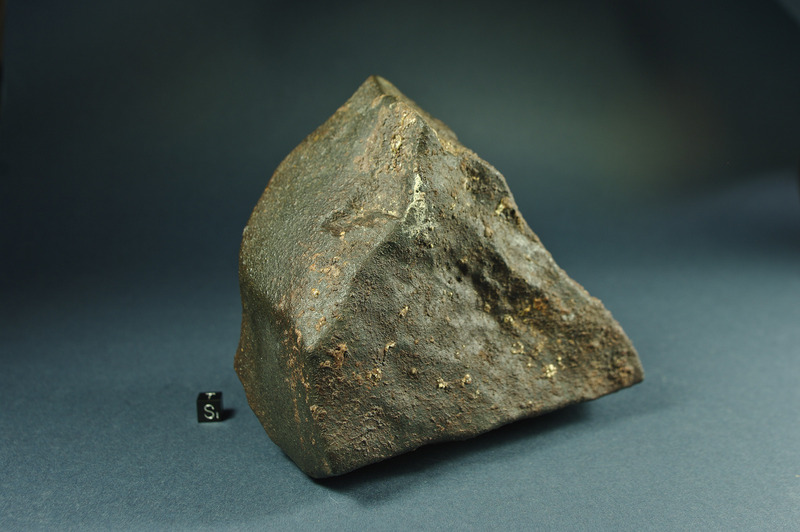 The meteorite was a sizeable specimen and had at least three kilos. It was the largest intact mass our two teams had found so far. In fact it was even larger than any meteorite I had ever found myself in one piece, I had to admit. The triangular meteorite showed a rich black fusion crust and on one side it was dimpled with broad and shallow regmaglypts. We were speechless and simultaneously happy for our Russian friends, who were enjoying their reclaimed serendipity. Later I would hold my side with laughing when the two showed me the photos of the Indian dance which Pjotr had performed on occasion of the find. It was hard to determine whether the large meteorite represented the same fall event as our smaller previous find. 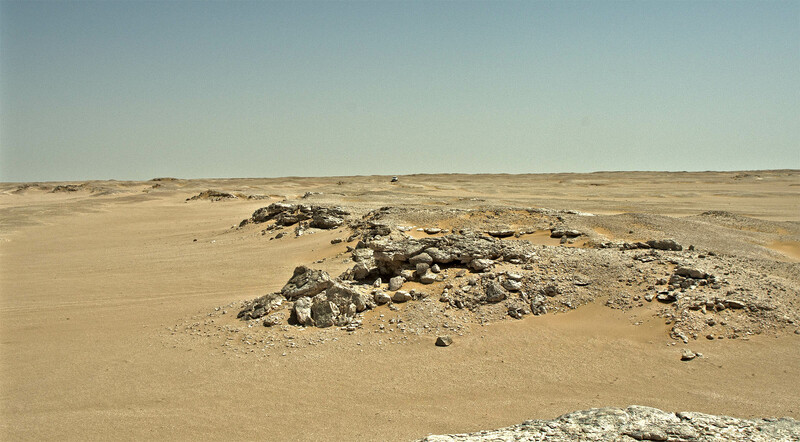 It looked considerably less weathered, but as we knew from experience, the appearance of meteorites from the same fall could differ drastically within a hundred meter radius, depending on various geological and geomorphologic factors. The magnetic susceptibility of both specimens however matched perfectly. The stone was of angular shape, indicating that the incoming bolide had fragmented during its descent. Rims and borders of the meteorite were ablated and covered with primary fusion crust, so the break up had occurred early in flight. Thus the distance to the next fragments could be considerable, several hundred meters probably, perhaps kilometres. One thing was for sure though: there were other meteorites around and we were determined to find them. We postponed our noon break and assigned new search grids to each car. Thomas and I would cover a strip leading from our current position two kilometres to the west while the other team would scan the same distance to the northwest. Then we would return and search towards the remaining cardinal points. After just two minutes we came across our next find. A 150 g fragment, badly weathered, covered with old desert varnish. Probably from another fall than the one we were chasing. Analysis in the lab would later confirm this assumption. Anyway, this was a busy strewn field. We had separated only a quarter of an hour ago. The others were still zigzagging about a kilometre to our north, barely visible in the billowing heat. Thomas was driving. The terrain was still difficult. Steep but shallow hills popped up behind each other, intersected by erosion furrows and sand filled depressions difficult to observe. Occasional dust devils swirled past us, briefly obscuring the merciless midday sun which shone from a cloudless sky the colour of quicksilver. We had stopped talking a while ago and now where fully immersed in our task. Later, when I wrote down the day’s events I would remember the air full of suspense, like charged by an electrical current. For several times, when the hills gave way to a more distant view, I used a steel or tin artefact to our far right as a reference point for orientation. I estimated it half a kilometre from us, about two thirds the way to where the other car was searching. As the Russian team was even closer, they probably used it for the same purpose too. The object had to be a sandblasted bucket, ammo box or canister of some sort, as it was too large for the common tuna can we occasionally found. With a howling engine Thomas steered through a wide gypsum deposit he had recognized a second too late. In the powdery soil we lost momentum rapidly. Cursing he kicked in the differential lock and desperately fought to reach a patch of firm ground. There was a rocky bank fifty meters to our right, unfortunately the slightest turn would inevitably have bogged us down hopelessly. So dead ahead was the only way out. Through the white dust and at the foot of a slope we had just passed, I thought I had briefly seen a dark rock. It would have been a bad idea to halt on the treacherous surface so I tried to memorize the spot to return there once we had reached a safe haven. Up to our axles in the fine grained silt we inched forward, the vehicle’s frame vibrating heavily and the air filling with the stench of the clutch. After what seemed like a brief eternity we closed in at the bank and finally the front wheels gripped at solid rock as we abruptly climbed the steep slope which Thomas had aimed at in a sharp angle. “Well done mate”, I congratulated us after we had gulped down several cups of water. “You won’t like to hear this, but you’ll have to get us back half way, we might have passed one” I said. After a long unbelieving stare, sweat dripping from his nose, Thomas replied: “You … can … walk!” I looked out the window into the billowing air and the prospect of walking the deep sand under the scorching sun seemed little auspicious. “Come on bro” I smiled, “keep our left wheels on the ground, follow that bank towards the small ridge over there, turn left, gather momentum and cross that depression, and then continue along the bank at the far side. Just hug the coast and we will make it.” “You push us out” he stated und kicked in the gear. After some tricky climbing along the steep bank, tilting our Toyota to frightening angles, we found the rock I had seen. It was an upturned stone, casting a small shadow which I had mistaken for a solid object. We turned to resume our course and again I caught sight of the crumpled tin canister in the distance. “Let’s pass there” I pointed towards the now familiar landmark, which was redundant as Thomas had already steered in its direction. We both continued to scan sideward and it was only after some time that I looked up for a general view around when I spotted the large can, which by now we had almost reached. It was twenty meters in front of us. With its bent and folded structure it was hard to imagine its original shape. I was still wondering about the former purpose of the device when we slowly passed it just a couple of paces to our right. “Stop” I whispered, and the car rolled to a halt.